Tonight’s the night Santa always visited the Haraldson house: the night before the night before Christmas. We were the only family I knew who opened gifts on Christmas Eve. My parents convinced my brothers and sisters and me that Santa started his trip in Minnesota (at our house specifically) in the early morning hours of the 24th before heading to the International Date Line where it was the next day already. That’s why we put out milk and cookies on the 23rd and our Santa gifts were under our tree on the morning of the 24th. It made total sense to me until I cracked the whole Santa thing when I was 9. More on that in a minute. On Christmas Eve, Dad would read Luke’s account of the Christmas story before we opened gifts. I always felt sad for Baby Jesus. What was a kid supposed to do with gold, frankincense and myrrh? Sure I got boring things like socks and underwear for Christmas, too, but my parents always got me a few things from my Sears catalog wish list. I just hoped Luke forgot to mention that Baby Jesus got a cool Matchbox car, too. My parents were awesome gift givers actually. In 1969, I was 6 years old, and on Christmas Eve, my parents gave me a gift that was too big to wrap. They told me to stand by the fireplace and shut my eyes. I was so excited and my imagination went into overdrive. What was it? A pony? A princess dress? My thoughts were dashed when my stupid little brother insisted that he stand there with me and I started yelling at him to go away, that this was my present. Mom gave me the finger snap and “the look” and told me to knock it off and shut my eyes. So I shut my eyes. 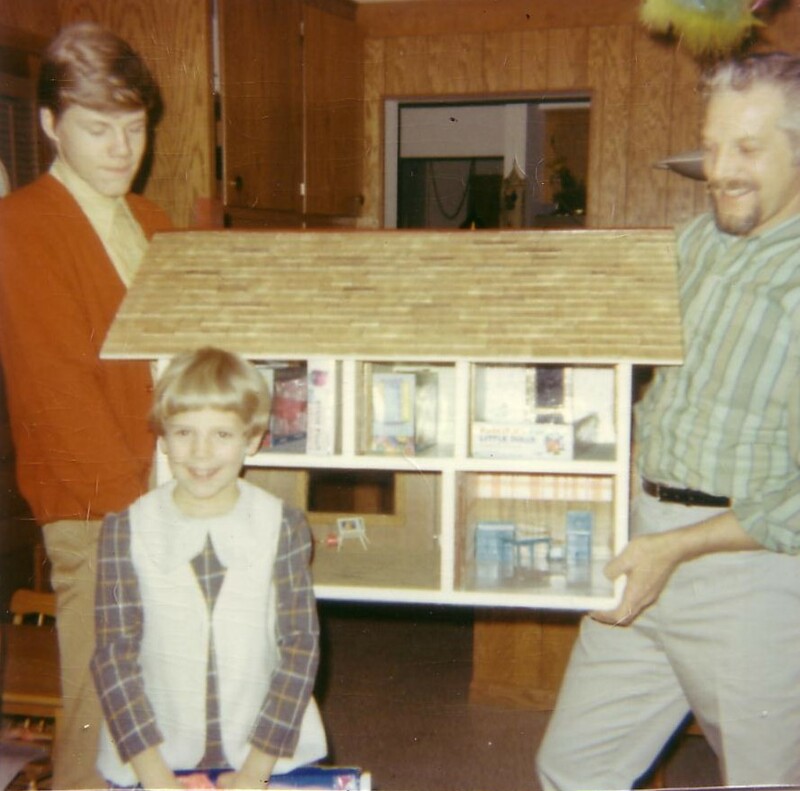 It felt like forever before she yelled “Open them!” There stood my dad and older brother holding a two-story wood-frame dollhouse with glass windows, and carpet in the living room and linoleum in the kitchen. Way better than a pony or a princess dress! The best part was that my dad made it. Forty years later, that well-loved dollhouse is in my basement, and will be Claire’s when she turns 3in October. 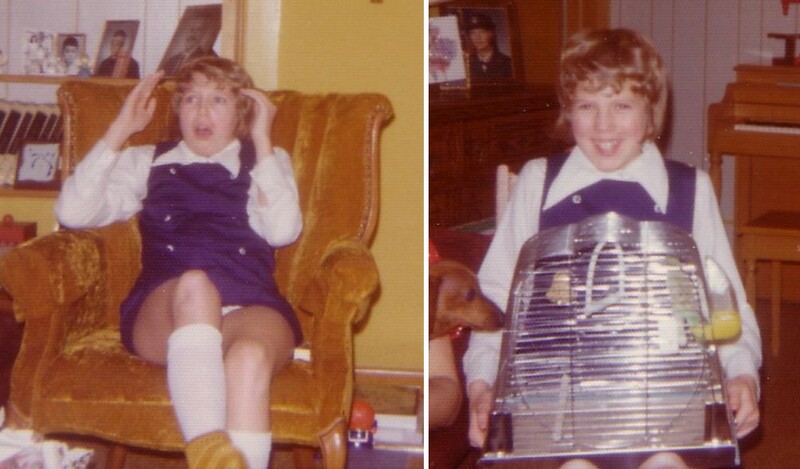 On Christmas Eve 1973, I had to shut my eyes again for a gift that was too big to wrap. Again my imagination went wild, but thankfully this time my brother stayed out of my glory. When Mom and Dad yelled “Open them!” there in the middle of the living room was a cage and a beautiful little parakeet inside. I’d like to deny that I cried, but as usual my mother caught the moment with her camera and there’s a permanent record of me smiling, tears streaming down my face, talking to my new pet, Pari the Parakeet. I loved that bird. For seven years Pari heard all my stories and kept all my secrets. He got sick once and lost a foot, but adapted well to having only one. He died one morning when I was 17 and we buried him in the garden. The week before Christmas 1980, I came home after working the dinner shift at Country Kitchen and found a large tin can on our front stoop. On top was written “To Lynn From Santa.” I brought it inside and asked if anyone knew who left it. Dad said it wasn’t there when he came home from work earlier and no one had heard a car pull up in the drive. That didn’t matter. Haraldson Christmas Rule No. 1: No gift shall be opened until Christmas Eve. No exceptions. So I spent a few hours analyzing the handwriting on the lid, the same way I did when I cracked the mystery of Santa. Santa always left a note of thanks for the cookies and milk, and when I got old enough to notice, I realized he used the notepaper my mom kept in the cupboard. It disturbed me to think of some old guy wandering around our house looking for paper and a pen. It was bad enough that we didn’t have a fireplace and had to leave the front door unlocked so Santa could get in, but imagining him turning on lights and sifting through our personal stuff made me a little uncomfortable. I was quite relieved the year I realized Santa had the same handwriting as my dad, only I had to keep it under wraps because my little brother was still too young to figure it out. I felt superior with this knowledge and was quite smug the following year when he learned who Santa was and I told him I’d known “for a long time.” “Well la-di-da” I think was his exact retort as he stuck his tongue out at me. This time, the handwriting wasn’t so obvious. Was it a boy’s writing? A girl’s? I couldn’t tell. There were a few strange regulars at the restaurant I worked at who’d probably want to leave me gifts outside my house, but that creeped me out too much to think about and so I just let the can sit under the tree for seven tortuous days. Told you my parents were awesome gift givers. This entry was posted in Uncategorized on December 23, 2009 by Lynn Haraldson. Okay so I love the doll house. Your brother doesn't look to happy in the picture, And I totally laughed out loud at the picture of you sitting on the left in the purple dress. That is such a funny picture. It gives me the giggles! I hope you have a wonderful Christmas and enjoy the holiday. It is so fun to spend Christmas with little ones! Awwwwww! Loved your story – and I remember when those “canned” gifts came out – you could go to a special store and they would can whatever you brought in. Very cool of your dad to do that! Thanks for sharing such fun memories. Have a very Merry Christmas! Really beautiful post, almost brought as tear to my eye. GREAT post! Wonderful Chrismtas memories! I LOVED making out my Chrismtas list from the Sears catalog – what a trip down memory lane for me! My sister and I studied that the catalog and carefully made our lists. Merry Christmas Lynn – all the best to you and yours! Lynn, I laughed out loud so many times while reading your post to my husband! Thank you so much for sharing your memories. Thank you for sharing your memories and I hope you make many more wonderful ones this year! Merry Christmas, Lynn! This was just what I needed to read this morning. Its 4am and I was feeling a little scroogy. I have such good memories too, and you brought a lot of them back for me. Grandpa always read the Christmas Story from Luke. I got some special 'unwrappable' presents too. And there were lots of rules about the when and where of present opening, which all just added to the fun and the mystery. Thanks for sharing this. Have a wonderful time with your family and especially the grandkids.